This is a Used Lenovo ideapad 100S-14IBR Laptop Win 10 Celeron N3060 CPU @ 1.6 Ghz Blue. Please refer to the pictures. This unit has been thoroughly inspected and tested by our in-house, factory-trained technicians. As a result of the technicians' professional handling and care, the unit has been returned to factory specifications. You can expect a fully-functional unit. . The Lenovo 320-14IAP is optimised to give you a great performing, general purpose laptop, with a good screen and extended battery life. Storage: 1TB HDD. Colour: Denim Blue. Screen size: 14" Anti-Glare Screen. Almacenamiento: 128GB SSD. SSD Capacity 128GB. Sistema operativo: edición de 64 bits de Windows 10 casa. Storage Type SSD (Solid State Drive). Tamaño de pantalla: pantalla de 14". Screen Size 14". Sonido Dolby HD Audio. Lenovo IdeaPad 330 15.6 Inch i5 8GB 500gb Laptop - Blue. Virtually as new - only used for a few hours, and still in original packing. New cost was £550, so a bargain for someone! Dispatched with eBay delivery – Shutl 1 day. Lenovo IdeaPad 330S-14IKB Laptop. Hard Drive 128GB SSD. What also makes the Lenovo IdeaPad so great is it's luscious design which weighs in at just 1.67 kg. The processor will be able to handle it without those annoying loading wheels in the middle of your screen. Sistema operativo: edición de 64 bits de Windows 10 casa. Hard Drive Capacity 1TB. Almacenamiento: disco duro de 1 TB. Tamaño de pantalla: pantalla de 14". Duración de la batería Hasta 6 horas. Screen Size 14". Lenovo Ideapad 330S 14" Multimedia Laptop Intel Pentium 8GB RAM 128GB SSD Win 10. EX-DISPLAY GRADE-A LAPTOP MAY SHOW SOME SLIGHT MARKS ON FRONT AND BACK. LAPTOP COMES IN ORDINARY BOX WITH AC ADAPTER.BOX CONTENTS: LAPTOP, AC ADAPTER.SPECIFICATIONS: Processor - Intel® Pentium® N4200 processor- Dual-core- 1.1 GHz / 2.5 GHz (Turbo Boost)- 2 MB cache RAM 4 GB DDR3 (1600 GHz) Storage 1 TB HDD, 5400 rpm Touchscreen No Screen size 15.6" ,TN LCD , 1366 x 768 Operating System Windows 10 Home Optical disc drive No Memory card reader 4-in-1 memory card reader Wireless - Wireless-AC- 1x1 Ethernet 10/100 Ethernet Bluetooth Bluetooth 4.1 USB - USB 3.0 x 1- USB 2.0 x 1 Video interface HDMI x 1 Audio interface 3.5 mm jack Camera 0.3 MP webcam Microphone Yes Mouse / trackpad Multi-touch trackpad Keyboard Full-size keyboard with numeric keypad Dimensions 22.9 x 378 x 260 mm (H x W x D) Weight 2. Lenovo IdeaPad 320 15.6" Cheapest Laptop Intel Dual Core N3350 4GB, 1TB HDD, W10. The Lenovo 320-14IKB is optimised to give you a high performance, general purpose laptop, with a good screen and extended battery life. Storage: 128GB SSD. Colour: Denim Blue. Screen size: 14" Anti-Glare Screen. 1 x Lenovo Ideapad 320-14AST Laptop. Storage 1TB 5400rpm SATA HDD 6.0Gb/s. Processor AMD A9-9420 3.0GHGz up to 3.6GHz, 1MB Cache, 2 Cores/2 Threads. Graphics AMD Radeon R5 Graphics. Display 14" (35.5cm) HD (1366x768), anti-glare, LED backlight, 200 nits, 16:9 aspect ratio. 1 x Lenovo ideapad 305-15IBD. Storage 1TB 5400RPM SATA 6Gb/s 2.5" Hard Drive. 1 x Lenovo 65W Power Adapter. Ports 2 x USB 3.0, 1 x USB 2.0, 1 x VGA, 1 x HDMI, 1 x RJ-45, 1 x Combo Audio Jack, 1 x Security Lock. 1 x Lenovo ideapad 320-15IAP Laptop. Storage 1TB 5400RPM SATA 6Gb/s 2.5" Hard Drive. Ports 1x USB 2.0, 1x USB 3.0, HDMI™, RJ45, Audio Jack. Hard Drive has been wiped with Blancco Drive Erasure. Optical Drive NO. Lenovo G580 15.6". 1x Lenovo G580. As part of the sale you"ll receive CCTV & DVR. Lenovo IdeaPad 320 14" Quad Core Laptop Intel Pentium N4200, 4GB RAM, 1TB, Win10. The Ideapad 330S is designed to make an impression with a streamlined chassis and a polished aluminium cover. 128GB SSD storage. 4GB RAM DDR4. Refurbished Product - An item that Is fully Functional and 100% Working. Lenovo g580 15.6". 1x Lenovo g580. As part of the sale you"ll receive. 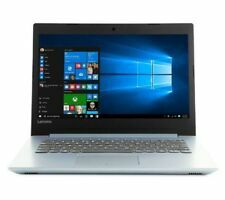 Lenovo IdeaPad 320-14ISK - 14" Best Laptop Deal Intel Core i3, 8GB RAM, 1TB HDD. Lenovo Ideapad 330S 15.6" Multimedia Laptop Intel Core i3-8130U 8GB RAM 1TB 16GB. Lenovo 305-15IBY 15.6". 1x Lenovo 305-15iby. FREE 12 Months Warranty. Our Product Note As part of the sale you"ll receive. Lenovo V130-15IKB - 15.6"- Core i3 7020U - 4 GB RAM - 128 GB SSD. LocalisationLanguage:English / region:United Kingdom. Product TypeNotebook. SecurityFirmware Trusted Platform Module (TPM 2.0) Security Chip. Has very good battery and has been factory reset ready for the new owner. Best Lenovo Laptop IdeaPad 320 15.6" Intel Dual Core, 4GB, 1TB HDD, Windows 10. The Laptop is inVery Good Condition and 100% working. Lenovo Ideapd 320 Laptop. 1000GB (1TB) HDD. i'm sure the new owner will not be disappointed. Pictures provided are of the actual item. Laptop Type. HERE WE HAVE FOR SALE AN EX DISPLAY AND IN MINT CONDITION A LENOVO IDEAPAD 110S-11IBR 11.6" LAPTOP 2GB RAM 32GB eMMC IN WHITE/BLUE COLOUR. Solid State Storage eMMC 32GB. The IdeaPad 110S ticks all the boxes. Lenovo IdeaPad 320- 14" SSD Laptop Intel Core i5, 4GB RAM, 128GB SSD, Windows 10. With box and manuals great for present. Lenovo V130-15IKB - 15.6"- Core i5 7200U - 4 GB RAM - 128 GB SSD. LocalisationLanguage:English / region:United Kingdom. Product TypeNotebook. SecurityFirmware Trusted Platform Module (TPM 2.0) Security Chip. Lenovo V130-15IKB - 15.6"- Core i5 7200U - 8 GB RAM - 256 GB SSD. LocalisationLanguage:English / region:United Kingdom. Product TypeNotebook. SecurityFirmware Trusted Platform Module (TPM 2.0) Security Chip.